« 40 years and counting! These shows , at the Ark and in Flint, are always special because these are the two towns where we really got our start and had some great success in the 1970s-early 80s. People come back that have seen us for ( or haven’t seen us in…) 20, 30…nearly 40 years. A pretty amazing note: when we played Pete Seeger’s Clearwater Festival just north of NYC last month, a woman came up and said “ Do you remember me?’’ It was the woman who was the dishwasher at the Brown Jug in the Summer of 1974 ( now a lawyer and judge J. She saw our name on the schedule and came to see us. And- my Mother and sister are making the trip out from Connecticut for these shows. Some of you in both Ann Arbor and Flint will remember my Mom: she and my Dad used to make fairly regular trips to hear us play, and met many of you in the good old days J And my sister…….well…..come meet her…the REAL talent in the family, and the one who gave me her guitar and taught me my first chords. The new CD is in! 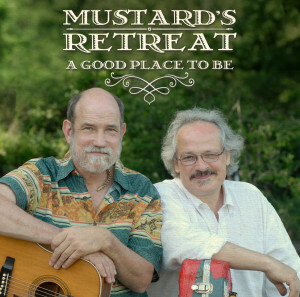 A Good Place To Be, is its title, and is available at this point only on our web page, www.mustardsretreat.com, or live at one of our concerts. Eventually I will get it up on iTunes , Amazon and CD Baby, etc. A Good Place to Be has 12 songs/stories on it. You can hear/ download for free two of them on our music player on our web site. Some of them have already proven to be favorites with audiences in concert: A Good Place To Be, A Reminder, The Night I Danced With Marie, Never Will, Wind Chimes and Trains. Others are favorites from years gone by, like Too Many Hands and I Loved Another Woman. And still others you may not have heard yet, but are favorites of ours! We really feel great about the recording, and all the amazing players and singers who contributed their talents. You can also order it by mail, for $18 ( includes postage, etc). Please make the check out to Mustard’s Retreat, and mail it to me (David Tamulevich) at 408 Westwood Ave., Ann Arbor, MI 48103. And- always glad to sign them if you ask! Find us on Facebook ( search for Mustard’s Retreat), to get the latest news, pictures, etc. And, as always, check our web page www.mustardsretreat.com for upcoming shows. The 40th year looks to be pretty wonderful already. We are so thankful to still be playing and singing, and as always, for you all for making it possible. You are family to us. Hope to see you soon..and enjoy the rest of the Summer!